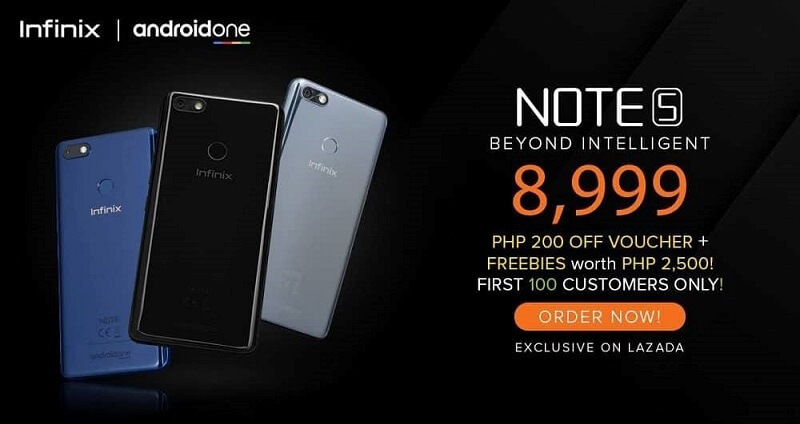 Home Infinix Mobility News Smartphones Infinix Note 5 Is Coming to PH; 18:9 Screen, Helio P23, Android One, and 4500mAh Battery for Php8,999! Infinix Note 5 Is Coming to PH; 18:9 Screen, Helio P23, Android One, and 4500mAh Battery for Php8,999! Infinix has announced the arrival of its Note 5 Android One smartphone in the Philippines! The Infinix Note 5 is a capable device packed with an affordable price tag. In case you missed it, the phone is dominated by a 6-inch TFT LCD panel with FHD+ 2160 x 1080 display and 18:9 aspect ratio. Under the hood, it is loaded with Helio P23 octa-core processor clocked at 2.0GHz, and is paired with Mali-G71 MP2 graphics. The phone carries 3GB of RAM, and 32GB of internal storage expandable up to 128GB via microSD card. Its stamina seems to be one of its key specs, as it is packed with a huge 4500mAh battery to accompany users on their daily mobile tasks. The Infinix Note 5 also comes with a good camera setup composed of 12-megapixel main shooter, and 16-megapixel selfie snapper. The handset runs on Android One. Meanwhile, Infinix revealed that the first 100 customers who will avail the Infinix Note 5 will get a Php200 discount voucher and freebies worth Php2,500! The Infinix Note 5 Android One will be available beginning August 1 at Lazada. It is priced at Php8,999.